For the first time since we've been married, we finally made a point to get home for harvest time! It is such a busy time around the farm, but there is always an excitement in the air. Unfortunately for us, harvest was a little late in coming this year, so the wheat isn't quite ready to cut. 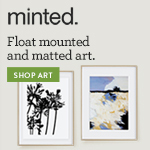 Fortunately for Mom & Dad, that means it looks like a good year! They've had a lot of moisture late in the spring this year. 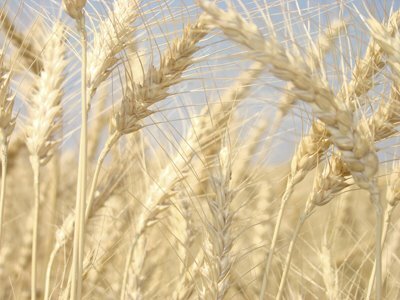 Here is a photo of the beautiful, tall winter wheat. For more photos, check out our Kodak Picture Gallery. 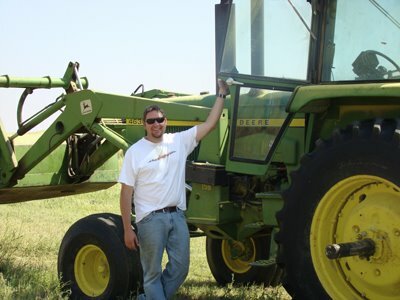 Here is Farmer Tom with his John Deere. Tom was prepared for this not to be a typical "vacation" and set to work mowing some weeds that were bullying out the grass that was supposed to be growing in a few fields. 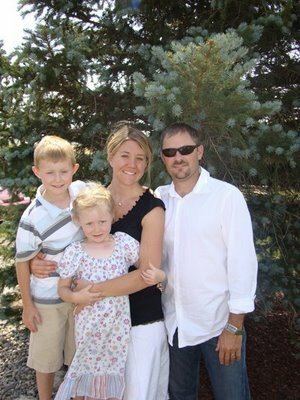 Tom had to leave for Durango today, but he'll be back on Thursday afternoon. He might be able to squeeze in a few more hours of harvest experience before we head down to Bozeman on Friday. I'm hoping we'll be cutting the wheat by then. 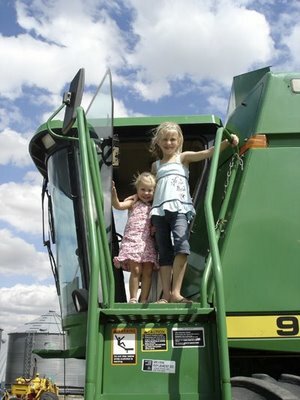 Abby and Sarah wasted no time climbing like monkeys all over the combine. Princess and the Pea: The wheat wasn't ready for cutting, but Dad is growing several fields of peas that were ready. 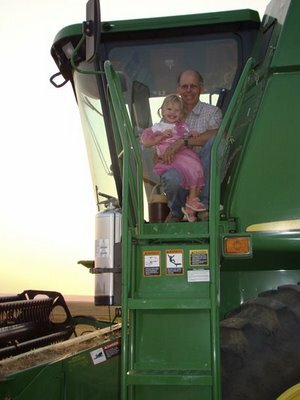 Saturday night Sarah went out for a ride in the combine with Grandpa, complete with dress-up. She has worn it every possible moment! Mom put me in charge of her camera for the week so I could try it out and see if I like it (I'm considering that model for myself!) So... be sure to see more harvest pictures in our gallery and check back later for updates! Also, I'm helping Mom and Dad set up their own blog this week. More details there at the Benjamin Ranch!